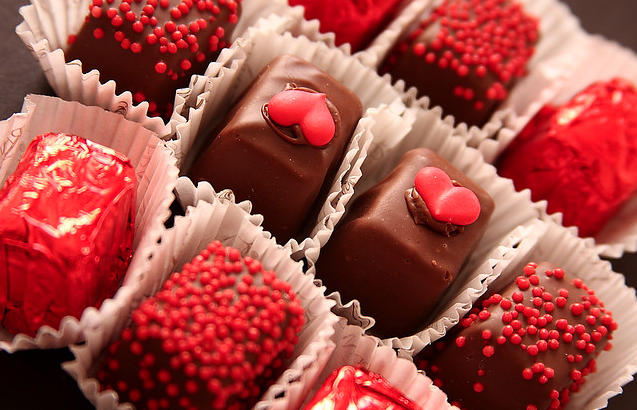 Thinking about what treats to buy your sweetheart this Valentines Day? Ignite Providence has put together a round-up of sweet stops around Providence for you! Providence’s first gourmet donut shop creates fun donuts daily, all house made and covered in delicious toppings! This valentines day stop in for one of thir coffee drinks and pick up some donuts. PVDonuts also offers vegan and gluten free options, along with delivery service. Our recommendation for a sweet gift? 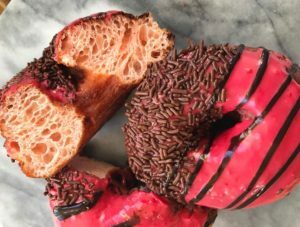 The strawberry or raspberry glazed donuts! This bakery doubles as a café, serving breakfawst and lunch aside their sweet treats. They have partnered with Flowers by Semia to make a one stop Valentines Day shop! Stop by to pick up Valentines Day essentials. Ellie’s also offeres year-round baking classes to teach others their baking secrets! Our recommendation for a sweet gift? The Mon Amour cake, a mini treat with raspberry and lots of chocolate! Looking for something fun to do this weekend? Check out these cool events happening in Rhode Island! Armory Farmers Market: The market is located at the corner of Parade and Hudson Streets in Providence. Come out and support your local farmers and buy some fresh fruits ad veggies. Begins at 3:30 p.m.
Geometer Exhibition By Steven Pestana : Visit GRIN for the geometer exhibition by artist Steven Pestana. The exhibition runs from October 15th- November 14th. The Jack-O-Lantern Spectacular: A nighttime display of 5,000 illuminated jack-o-lanterns all along the beautiful Wetlands Trail, with well over 100 of the pumpkins carved into veritable works of art. Located at the Roger Williams Park Zoo, opens at 6 p.m. This week celebrates the anniversary of the attack and burning of the HMS Gaspee in Providence. Throughout the weekend, there will be several events to commemorate this day including, guided tours and a Full WaterFire lighting. Also, this weekend is the Providence International Arts Festival, an experience like no other! Come join us for performances and art installations throughout the city Thursday-Sunday. Food Truck Friday at Roger Williams Park 4:30- 8:00 p.m.
Hope Street Farmers Market 9:00 a.m. – 1:00 p.m.
2015 Festival of Historic Houses 10:00 a.m. – 4:00 p.m. Since the first Festival, more than 50 years ago, The Providence Preservation Society has showcased contemporary living in historic homes. Imagination Playground Providence Children’s Museum presents Imagination Playground where kids invent their own ways to play as they stack and build with huge blue foam blocks of all shapes and sizes. Event is from 10:00 a.m. – 2:00 p.m.
Rock ‘N’ Roll Yard Sale The Providence Public Library downtown will host a Rock ‘N’ Roll Yard Sale from 12:00 p.m. – 8:00 p.m. Enjoy live music and dj while browsing the vendors’ tables. Gaspee Day at the John Brown House John Brown, the Providence merchant who promoted the attack on the Gaspee, later built and resided in a magnificent 18th century mansion. The John Brown House Museum at 52 Power Street will be open from 10 a.m. – 7:30 p.m. with guided tours at 10:30 a.m., noon, 1:30 p.m., 3:00 p.m., 4:30 p.m. and 6:00 p.m. Self-guided audio tours are available on a first-come, first-served basis. We will emphasize John Brown’s role as organizer of the Gaspee event and will make sure that everyone sees the painting in the museum that records the burning of the Gaspee. 10:00 a.m- 7:30 p.m.
Gaspee Day at the Governor Stephen Hopkins House Make time to see The Governor Stephen Hopkins House located at 15 Hopkins Street (off Benefit Street) and open for tours between 1:00 and 9:30 p.m. Admission is free, donations are always welcome. 1:00 p.m.- 9:30 p.m.
Waterfire: Full Lighting Sunset: 8:21 p.m. Lighting time: 8:46 p.m. The fires will remain lit until 12:30 a.m.
Hao Ni “Ghost Hit Wall” Reception Yellow Peril Gallery is pleased to present “Ghost Hit Wall” by Hao Ni, featuring an eclectic series of video, mixed media installations, sculptures, and drawings from June 11 – July 19, 2015. The opening reception is Saturday, June 13 from 6PM – 9PM. One Providence Experience The Columbus Cooperative and The Imaginary Company proudly present One Providence Experience a free and open to the public event on June 13th. A part of the Providence International Arts Festival. Providence International Arts Festival 12:00 p.m- 9:00 p.m.
Therese a lot to do this week in Providence and a lot of great fresh Farmers markets to visit. From ballets, historic tours, even learning the best way to use your audible spaces. We all hope you can get out and enjoy what the city has to offer this week. Will see you next week with more. From August 30th-October 12th, the David Winton Bell Gallery will be holding an exhibit on Audible Spaces. Pam Carely will be discussing and signing copies of her book Elderly Parents with all their Marbles- A Survival Guide for the Kids. Join the Providence Public Library every first and third Tuesday of each month for a free guided tour of the historic building. This week you can spend an evening being inspired by Rhode Island’s creative, attend an annual luncheon, hear a lecture on the state of the arts in academia, attend an artists’ reception, enjoy a concert series, and sample farmers markets! This week you can spend an evening being inspired by Rhode Island’s creativity, attend an annual luncheon, hear a lecture on the state of the arts in academia, attend an artists’ reception, enjoy a concert series, and sample farmers markets! As always, if you have any upcoming events to suggest, feel free to drop us a line. An Evening of Inspiration brings Rhode Island’s creativity to you! Mohawk and Rhode Island Creative Magazine are teaming together to put on a night of inspiring creation. Mohawk is proud to celebrate makers everywhere, and they have begun this new series to celebrate and highlight their passions. Enjoy catching up with neighbors, meeting up with friends or taking a break with co-workers to feast on their buffet and relish the water views. Complimentary wine will be served, along with an array of salads and buffet foods. The Hope Street Farmers Market is a farmer-run cooperative created and managed by many of the best farmers and food artisans in Rhode Island. This market sells fruits, vegetables, flowers, cheese, breads and pastries, pasture-raised meats, seafood, poultry and eggs, and many other items that farmers grow, make or raise themselves. The Hope Street Market is open every Saturday morning from 9 to 1:00 and Wednesday afternoons from 3:00 to 6:00. Load up your shopping bags with great things to eat, listen to live music and spend time with your neighbors – all at Lippitt Park where Hope Street and Blackstone Boulevard meet. The URI Feinstein Providence Campus Arts and Culture Program presents The State of the Arts: URI, RIC, CCRI. Faculty, student, alumni and retired faculty art will be on exhibit from June 2nd to June 30th at the URI Feinstein Providence Campus Gallery. There will be a Gallery Night reception and recognition program on June 19th from 5-9pm. Alaina’s body of work for this exhibit at Studio Z is titled “Stuff We Like”. VF has titled his body of work for this exhibit “Martial Memories”. The event will be held in Gallery Z. Hear In Rhode Island and Roger Williams National Memorial will present several evenings of music featuring local singer-songwriters as part of the Downtown Sundown Series. Experience an “outdoor coffeehouse”. Performers on June 21st include Steve Allain, Emma Joy Galvin, Tracie Potochnik, Lisa Couto & Ray Cooke. Attend this jazz concert fundraiser to help keep Music on the Hill going year after year! Featured image from Guys in the Know. This week you can see a Brown University Alumni exhibition, enjoy an evening with the Providence Premieres, attend a salon by Neal Overstrom, view art by Linnea Toney, and more! If you have any events to recommend, feel free to drop us a line! In celebration of Brown University’s 250th anniversary, the David Winton Bell Gallery presents the Brown University Alumni Exhibition Part 2, featuring work by alumni Sarah Morris ’89, Rob Reynolds ’90 and Taryn Simon ’97. May 25th is the last day to view this alumni exhibition. Join us for a tour-de-force evening of local talent as a lineup of Rhode Island’s All-Star classical musicians and composers present an exciting and innovative program of New Music. Featuring 5 World Premiere Commissions written especially for the concert, the evening will be presented in an exciting 70-minute format to include projected media and electronics. The RISD Edna Lawrence Nature Lab Director Neal Overstrom discusses “Collecting Nature: Menageries, Museums, and the Human-Nature Connection” (with a digression on a 21st century giraffe). Part 4 of ‘What use is the giraffe?’, The Evolution of Science, Society, and Spectacle in the Cosmopolitan 19th Century, is part of a series on the giraffe who went to Paris in 1827. Don’t miss out on one of the last Winter & Spring time farmer’s markets in Pawtucket! Get your locally grown foods to enjoy for the week. This year’s Hope Street Spring Block Party is sure to be a great event with live music, great food, and merchant specials. There’s fun for the whole family, including a beer garden, a fashion and wares show, and a ton of activities for the kids. Musical guests featured at this Hope Street event will include Ravi Shavi, Atlantic Thrills, Jay Berndt, Huge Face, Uke Springsteen, Joe’s Backyard Band, the Classical High School Jazz Band, and more to be announced! ArtProv gallery’s new exhibit, “Inspired Color,” features the large-scale works of abstract painter Linnea Toney Leeming. Linnea Toney Leeming is an abstract painter whose multi-faceted career as an artist, educator, and photographer has spanned more than 30 years. Thank you to (Up)Beat Cancer: Joe Andruzzi Foundation presented by East Commerce Solutions, Inc., RI Rally4Recovery, The U.S.-China Institute and Confucius Institute at Bryant University & National Grid for sponsoring this event! The fires will be lit shortly after sunset (6:46PM) and will remain lit until midnight. This weekend marks the Fall Eqinox. As the leaves change and the days grow shorter and cooler, the beauty of New England is in full force. Be sure to enjoy the varied palette of colors along historic Benefit Street and take a walk over to Prospect Park for a birds-eye view of the entire downtown skyline. This is the perfect time of year to enjoy a walking tour of Providence where you will discover the complex history of the city as well as enjoy the insights and historical perspective offered by your tour guide. As we light the braziers at each WaterFire, enjoy the crackle of the flames and the crisp feel of the night air as you join us to usher in the season of magic and wonder. Due to popular demand, and the generous support of Downtown Providence Parks Conservancy sponsors, the Burnside Park Music Series has been extended September 19! This week we welcome Gurpo Sazon to the Burnside Park music stage, a dynamic Latin band that has been featured at WaterFire on two occasion. This is the final evening of the summer music series so get out and check it out. The beer garden is open at 4:30, music begins at 5:30. Free & family-friendly! What better way to check out all of the various artists throughout Providence than to check out ‘Gallery Night Providence’! This is a free, fun-filled introduction to Providence’s exciting art scene that is held on the third Thursday of the month, from March through November. This annual, worldwide event, encourages artists, designers and citizens to transform metered parking spots, or parking lots, into temporary public parks and works of art. With over 30 participating businesses and organizations participating throughout Providence, this will be a great excuse to get out and walk around town. Perhaps you will discover a new park, an outdoor library, cafe seating, a musical ensemble, an art show, a mini-farmers’ market, you name it. Let’s go PARK(ing)! Taste Trekkers is the nation’s first food tourism conference and is taking place downtown Providence. This event is specifically designed for people who plan their vacations around food. This is a great opportunity to experience insight from locally and regionally renown chefs and farmers, wine makers and beer brewers, food bloggers and travel writers, all with one goal: to show you how to explore the world through food. Conference begins on Friday and extends through the weekend. 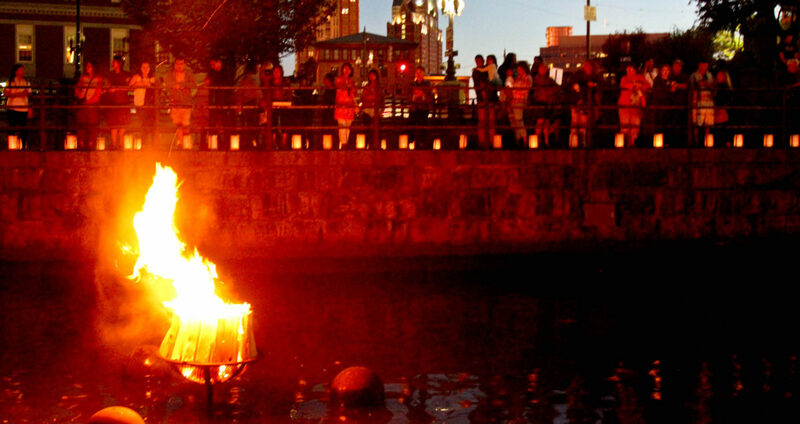 With events starting at 1:30pm, we have a lot in store for you this evening at WaterFire. Check out Rally 4 Recovery‘s annual festival at Roger Williams Memorial Park where you can hear great bands and enjoy other family friendly events. Stop by the WaterFire Arts Festival Plaza on Washington Street where you can view and purchase locally made glassware, jewelry, paintings, photography, clothing and more. Be sure to stop the College Street Bridge to check out the tent featuring FoodForward, an event brought to you by RallyRI and WaterFire to showcase some of Rhode Island’s food innovators where you can learn more and sample some great products. Hop on/Hop Off Shuttle helps you get around Providence easier! The folks over at Experience RI have introduced a “hop on, hop off” shuttle that travels throughout Providence from 5pm to 1am every Saturday night. Tickets will entitle you to unlimited hop on/hop off service all night long from 6pm – 1am at locations throughout the city. This is a great way to get around Providence and experience all that our charming city has to offer. The Philharmonic Pops Orchestra are performing at Slater Park in Pawtucket at 5:30pm, just a quick jaunt North of Providence. This is their final outside concert and should not be missed. Free and family friendly, Slater Park is a beautiful location for listening to an evening concert.